IDO Co., Ltd. IDO is a company specializing in fermenting herbal medicines. It ferments a variety of medicinal herbs with respectively different parts and features of leaves, roots, stems, and flowers, etc, helping make the curing ability of herbal medicines more stronger and has been researching, developing, and producing various types of products ranging from foods and soaps to cosmetics. IDO is putting its reason to purify the body and mind in a cup of tea based on thorough selection of raw materials. │Company History│ IDO-means the order and nature of how to live a life that is healthy in mind and bodyAs our name implies, all our products are in accordance with nature.IDO's fermented-herb teas use only natural ingredients based on our unique re-interpretation and further refinement of traditional Korean medicine. 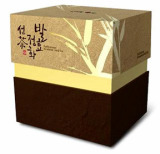 │ Products│ Fermented tea possessing great taste and flavor as well as health benefits. Fermentation removes bitterness and strong scent from the herbal medicine and delivers smooth taste. 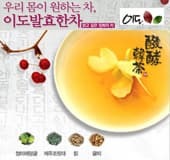 IDO has expertise in fermentation of herb raw materials used in the practice of highest-quality traditional Korean medicine. Fermenting various herb raw materials such as leaves, roots, stems, flowers make medicinal effects of each more potent. Leveraging our expertise in medicinal herb materials, Edou researches, develops and produces soap and cosmetics. Edou's strict quality control begins from the selection of the raw materials. │Quality Control System│ IDO uses organic, natural raw materials produced primarily in Korea. IDO obtained ISO9001, but our internal standard for the selection of raw material is stricter than any other international certification standard.